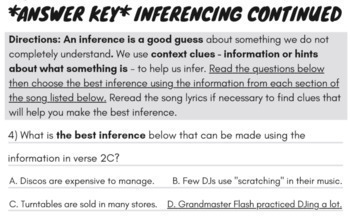 This making inferences reading passage is a nonfiction text with worksheets based on our rap song about the history of Hip Hop music. This activity makes for a great making inferences mini lesson. 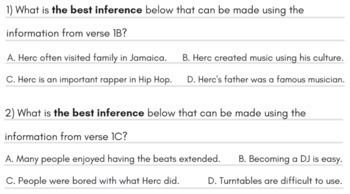 The inferencing worksheets for this activity challenge students to infer information about Hip Hop and rap music and its founders based on the reading passage. 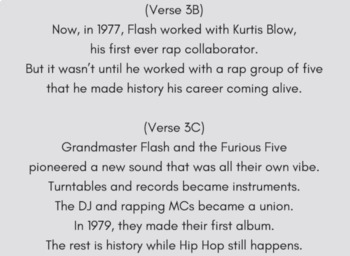 This passage utilizes the Hip Hop history song, exploring how two founding fathers and a mother of Hip Hop contributed to the urban art, and how it developed into a unified sound. Listen with subtitles on YouTube! - Explain the concept of inferencing using the instructions on page 1. - Next, have students listen to the song while following along with the lyrics on pages 3 and 4. - Guide students through answering question 1 as a class. Review with them as necessary. - Students will now answer the remaining 5 multiple-choice questions. - The answer key is located on pages 5 and 6. You can also get the digital, Google Forms activity for this resource here! 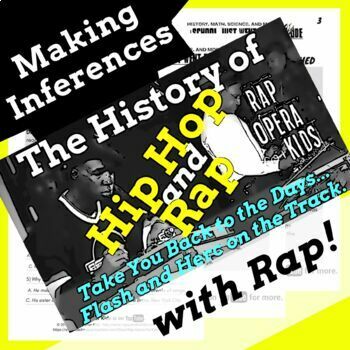 Copyright © 2018 Rap Opera for Kids. All rights reserved by author. This product is to be used by the original downloader only. Copying for more than one teacher, classroom, department, school, or school system is prohibited. This product may not be distributed or displayed digitally for public view. Failure to comply is a copyright infringement and a violation of the Digital Millennium Copyright Act (DMCA). Images and elements found in this PDF are copyrighted and cannot be extracted and used outside of this file without permission or license. Intended for classroom and personal use ONLY. Used under CC BY (2.0) / Originals have been digitally mixed with other media.